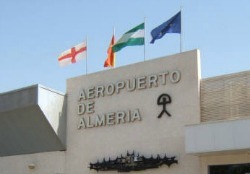 The airport is west of Granada and 9 km outside the city of Almería. It is small and modern and easy to find your way around. Direct flights from the UK to Almería go from Manchester, East Midlands, Birmingham and London Airports. Carriers include easy jet, Flythomascook, Iberia, Air Berlin, Ryanair, Monarch and Thomson Flights. World map Check Skyscanner for the best deals. If you are hiring a car the company desks are found in the arrivals hall and you might want to check that the company you go with has parking at the airport rather than off-site. Taxis are available outside the arrivals hall as well as the Bus #L22 which runs a regular service that will get you into the city centre in about 30 minutes. Go here for timetable information. There is no rail link at the airport but there is a station, conveniently located in the same place as the bus station, in the city centre which operates services to Granada, Seville and Murcia.